The DSE8660 is an easy-to-use single or multi-mains controller with automatic transfer switch capability. Designed to synchronise single or multiple DSE8610s with single or multiple mains (utility) supplies, the DSE8660 will automatically control the change over from mains (utility) to generator supply or run generators in synchronisation with the mains (utility) to provide no-break, peak lopping and peak shaving power solutions. 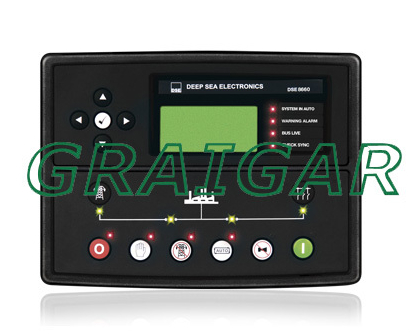 The module can indicate operational status and fault conditions on the LCD screen (multiple languages available), by illuminated LED, audible sounder and SMS messaging. Comprehensive communications are also available via RS485 and RS232 for remote PC control and monitoring, and integration into building management systems. The comprehensive event log will record up to 250 events to facilitate maintenance. An extensive number of fixed and flexible monitoring and protection features are included. Easy alteration of the sequences, timers and alarms can be made using the DSE PC Configuration Suite Software. Selected configuration is also available via the module’s front panel. With all communication ports capable of being active at the same time, the DSE8600 Series is ideal for a wide variety of demanding load share applications. • Volts and frequency matching.